Step by step tutorial on how to show the 360° view of your product in Ebay. 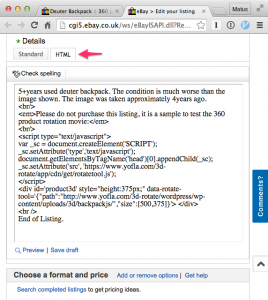 Due to changes on Ebay’s side this embedding method does not work. If you want to show a 360 view in ebay, please use the Animated GIF export option. 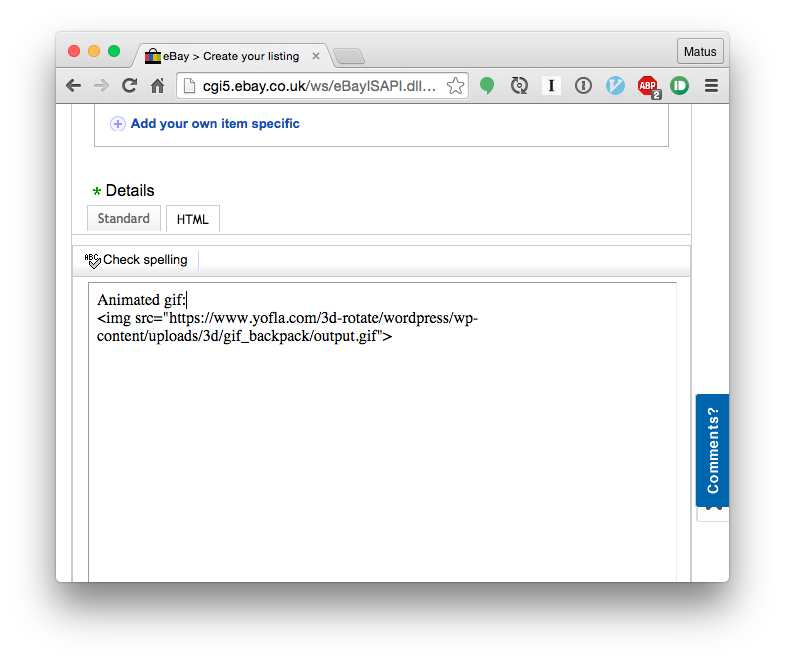 In the HTML tab provide link to where you uploaded the exported animated gif of your product. Export your 360° product rotation using the 3DRT Setup Utility and upload it to your web server (or to a cloud service). It is possible to place the 360° rotation only in the product details/description. This is the embed code from our example, see description below the image how to customize it for your product. 5+years used deuter backpack. The condition is much worse than the image shown. The image was taken approximately 4years ago. The path url points to the directory you have created using the 3DRT Setup Utility and uploaded to your server. You set the width/height of the 360° player by updating the [500,375] values in line 14. Important: Please update also the height in style=”height:375px;” on line 13. Ebay displays the description in an fixed-height iframe and needs to know how tall the content will be. Note: Player files 1.4.9 or newer are required, otherwise the 360° view is always scaled by ebay to 150px in height.